Does anyone know where to purchase a real, working, alembic head (not some pseudo-alembic like what is sold on eBay) for a reasonable price? Less than $200 preferably. I am considering reaching out to local glassblowers since I cannot seem to find anything online for a decent price, although my search a year ago was unsuccessful. I might have to just end up ingenuitively rigging something up differently that will accomplish what I seek to accomplish. Getting even more specific, I would love for it to have a wide mouth but I realize this will certainly make things more expensive than I am willing to pay right now. Ordering overseas is totally fine with me; I am willing to wait 1+ months to receive my product if the price is good! If anyone has an alembic laying around that they are not using please reach out! The only thing that alembic head is missing, is a ground glass joint, but you won't find one in such a quality in that price range anywhere. I worked with self made fluor/water/oil/clay mixtures too, but for me it's too messy this way. That last ad is the closest you will find. Ive done this mission many times myself. The alembic that i own cost almost $700 if i remember well. Considering that a regular 2ltr boiling flask with wide mouth is an astounding $350 per round bottom flask; your pricerange is barely suitable for this kind of purchase. Go with the last ad for sure. There is a great glassblower in Tasmania that ships world wide and did some good quotes on pelicans for me. Id recommend him; however, $200? Get a job bro you cant even do the groceries for $200. I've had THIS / THIS custom-made a while back for a particular experiment. I couldn't spend too much on the width I wanted (12cm), so I went for half (6cm). It still worked for the purpose of that experiment. Special Orders: Special orders are welcome. Our standard policy on special order items is a 50% non-refundable deposit. No returns of special order items. So, what you can do is send them a request to make you an alembic head like the one they sell but with larger glass joints. Of course, it's going to cost you more, but these guys seem to be the most reasonable when it comes to price. I agree; ive never seen a deal this good actually. Not even close. train would most probably work just as well. If you want it to work at it's best then look to the theory of how the head works. buy what you need to do the work, Time Is Short. I used these guys www.eirglass.ie for an alembic and a pelican (2L for both). I believe they charged me 475 euros for both. Nicest guys ever!! The borosilicate glass is also top notch. I didn't have to pay GST since I'm not in EU and shipping was $55 for both items. 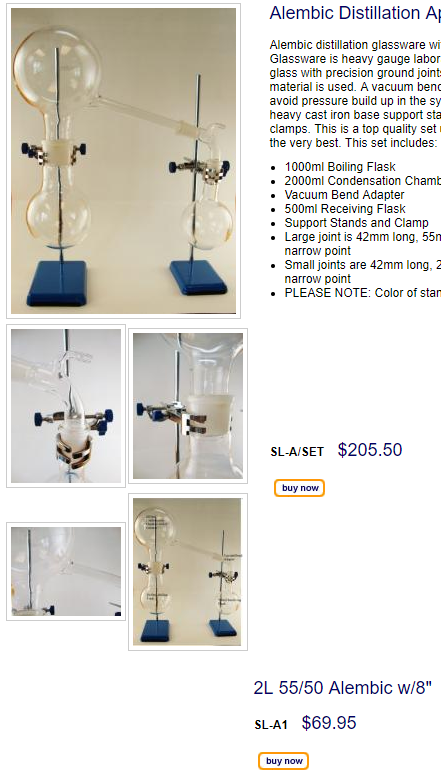 For example, a 5000ML round bottom flask with a 55/50 joint for $109. Not sure if I've seen anything cheaper. It depends on what you want to use the alembic for. If you are distilling things like alcohol, for example, then the others are better designed. 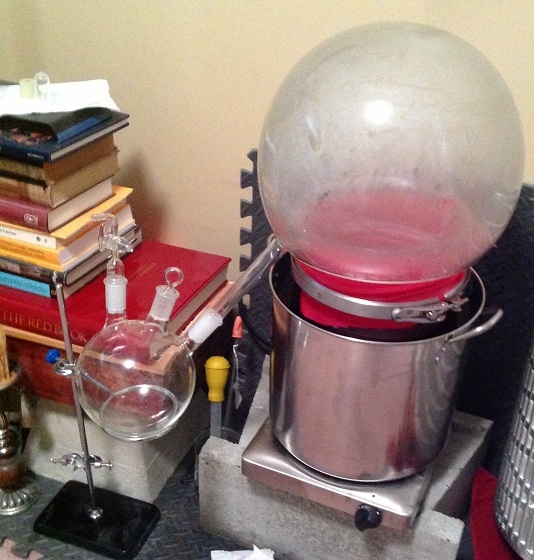 But if you are distilling things like butter of antimony, for example, the $70 one is better designed.